Versatile and distinctive, our Wash Troughs offers the solution for both high usage and sophisticated washrooms. We offer the choice of two standard wash troughs, Citrus and our Designer range. The Citrus Trough is manufactured from a single piece of Corian solid surface material that is thermoformed to create a hygienic, smooth, curved profile. 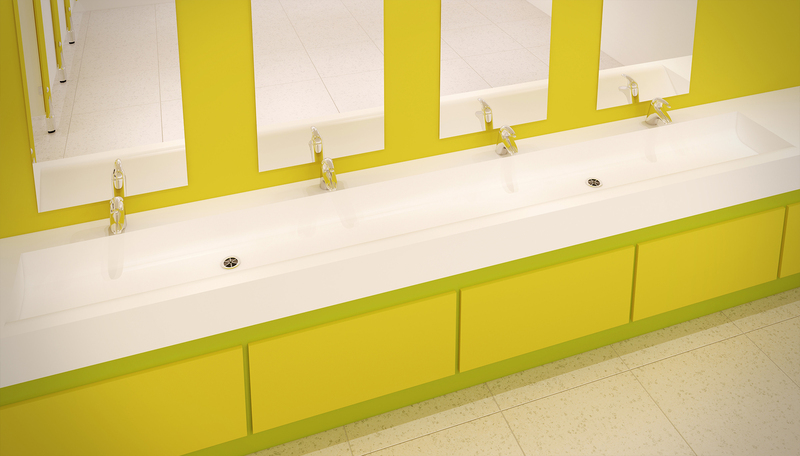 These troughs are equally at home in the open plan concept of modern school washrooms and also in commercial applications that are tight on space. Our Designer Troughs have been designed to be both practical and visually stunning, from the base of the trough gently sloping towards the inconspicuous drainage slots at the rear of the trough to the thoughtfully designed removeable stainless steel waste box that houses the overflow. All our Designer troughs are made to measure to perfectly fit your washroom. We can even manufacture a smaller version suitable for the ultra-modern and poplar super loo layout. Even though both versions of our troughs are made to measure they are both available on very short lead times.